The end of winter is the perfect time to clean not just the windows of your home but the entire house. It’s also the perfect season to declutter and organise your home by getting rid of things you can do without. Truly, this is easier said than done! To help you get that good spring clean, here are spring cleaning tips to live by. 1. Gather all the stuff that must go into the bin. Before you start in cleaning any part of your home, it’s best to start removing all the items inside that you know you have to dispose of. Get a huge rubbish bag then walk from one room to another, taking broken and worn out items then putting them in the rubbish bag. When you’re done, get another rubbish bag then search through your home for items that you no longer use and need, but can be donated to others. Once done, get all the rubbish bags with broken items and shoot them into a Lake Macquarie skip bin. Set aside the bag with items you’ll donate later so you don’t end up throwing them into the skip bin. 2. Find items that you can sell. You’ll be surprised by how many items in your home are not often used anymore yet are still in good condition. Gather them all up and put them in a box. Then sell them in your own garage sale or online. After you’ve rid your home of all the things that you no longer want and need, it’s time to engage in cleaning. Start by cleaning all the windows that have gathering the most dust and dirt. Then tackle the windows that aren’t that dusty but will need cleaning. Use a soft wet cloth with water when cleaning glass windows. After the dust has been removed, dry the windows up with old newspapers. 4. Freshen up your bathroom. If your home isn’t cleaned regularly, chances are you can smell a number of scents inside, especially the bathrooms. For this reason, it makes sense to clean bathrooms and deodorise them after. Soon, every family member will look forward to using the bathrooms no matter what season it is. Your freezer may also have all sorts of smells in it so clean it, too. First, remove all items that have expired or are not fit for eating. Then clean it using baking soda, a safer and more effective alternative to harsh cleaning agents. 6. Organise your closets and cabinets. Since you already went from one room to another, removing everything you can throw out, donate, or sell, the next thing to do is to organise the items left. You’ll be surprised at how much fresher and more spacious your things look once you remove everything that’s not supposed to be there anymore. 7. Get rid of clutter in your garage. Throw items that are rubbish in the hired skip bin, then set aside those for donation and selling. After that, you can start cleaning it and organising the items that you are keeping. 8. Use a skip bin hire service. To make spring cleaning more convenient, hire skip bins to help you with proper waste disposal. Your Lake Macquarie skip bin provider will take care of your rubbish for you – so that is one less thing to worry about. At Lake Macquarie Skips, we offer premium skip bins and rubbish management at a price that won’t burn your pocket. We offer different skip bins in Lake Macquarie with sizes that you can choose from, depending on your need. Our skip bins range from 2m3 to 30m3. No matter what your waste disposal needs are, we have skip bins that can accommodate them. 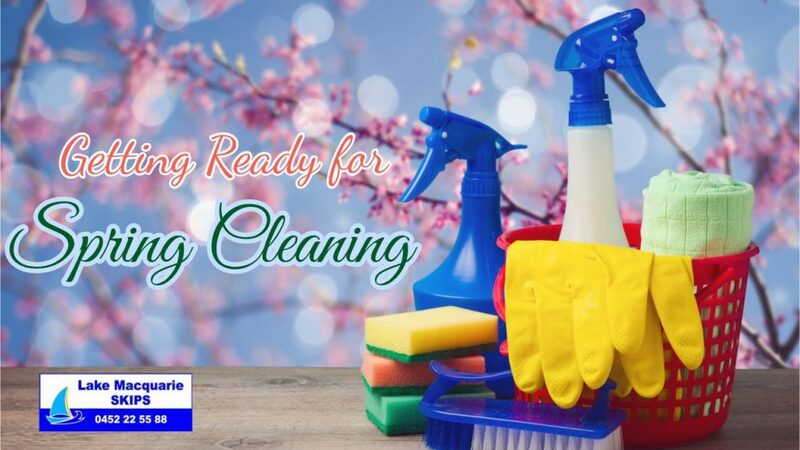 Planning for your spring cleaning soon? If you are located in Lake Macquarie and Newcastle, let us be your skip bin hire provider. Conveniently book online with our efficient online booking system whenever you’re ready. For more enquiries, just call 0452 22 55 88!